Great hunting in the grand Southern tradition. Experience is what Roblyn’s Neck Trophy Club is all about. No other hunting lodge has a richer hunting tradition nor can they deliver the quality of hunting we provide. 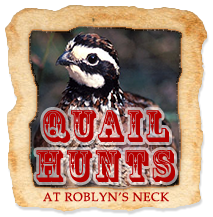 Roblyn’s Neck is no ordinary hunting destination, no over-hyped game preserve that fails to deliver on its promise, and no fenced in petting zoo for harvesting pet deer. This is the highest quality hunting — for deer, hog, turkey, quail, dove and small game — in the South East. Roblyn’s Neck is comprised of 14,000 contiguous acres with 200 tree stands, each providing you with a unique hunting experience. Our guides know every trail, stand and food plot to the last detail. They will help you from beginning to end, from stand selection to dressing your trophy-class game, to ensure that you have a successful hunting experience. Make this year your year to discover the finest hunt the South has to offer! Call us today and reserve your one-, two- or three-day hunting package. Your next hunting trip just may be the trip of a lifetime. We have been under progressive game management for more than 25 years. By working with SCDNR biologists to enhance every aspect of our deer habitat, we increase your chances of taking trophy-class whitetails. We're easy to get to, whether you're traveling from the Northeast or the Deep South. We offer great variety. Hunt with bow or rifle, large and small game. We're big, with more than 75 miles of trails providing access to 14,000. We're friendly and helpful, treating our guests like members of our family. – Real words from our friends who have written. Thank you for your support. We’re easy to get to, whether you’re traveling from the Northeast or the Deep South. We’re big, with more than 75 miles of trails providing access to 14,000. We’re friendly and helpful, treating our guests like members of our family.